Step out of the city life by going to Floriade and ANZAC Parade Walk. Visit St John the Baptist Church and Ginninderra Village for their historical value. Explore Canberra's surroundings by going to Paddys River (Canberra Deep Space Communication Complex, Gibraltar Falls, & more). Spend the 29th (Thu) exploring nature at Namadgi National Park. 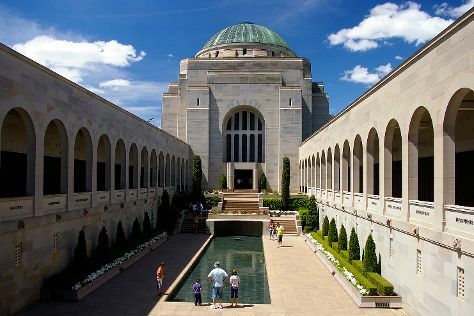 Next up on the itinerary: get engrossed in the history at Australian War Memorial, explore the world behind art at National Portrait Gallery, explore the striking landscape of Australian National Botanic Gardens, and make a trip to Mount Ainslie Lookout. For reviews, where to stay, photos, and other tourist information, refer to the Canberra travel route planner . Cairns to Canberra is an approximately 7-hour flight. You can also do a combination of flight and bus; or drive. Traveling from Cairns in November, you will find days in Canberra are slightly colder (28°C), and nights are colder (10°C). You will leave for home on the 9th (Wed).